The weather we have encountered in China deserves some note. We have veered from almost unbearable tropical heat and humidity in Yangshuo to the chilliness of Lijiang, which currently has me wearing three layers of special warm clothing and two pairs of socks. The most ideal temperatures we encountered were in Dali, but then it decided to get wet ... and it sure did that in spades. 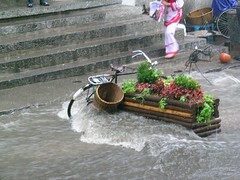 This downpour was so heavy that the downhill-running streets turned into rivers that washed over bicycles and had walkers struggling against the current. Everyone took shelter under eaves and waited for it to clear. I was beckoned into a furniture store and spent a pleasant half an hour watching the events outside and sipping hot water with the young lass running the place. 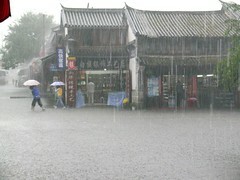 As I write this in Lijiang, it's raining and has been all day. But after a big previous two days, it gives us a welcome excuse to spend the day veging out and letting Phil's dodgy tummy (again!) recover.